"Orangutan" comes from the Indonesian for "man of the forest". So I guess this is the "man of the forest of the sea". Achaeus japonicus is a small spider crab from the warm, colourful reefs of the western Pacific. They're really tiny, with a carapace only a couple centimetres (an inch) across. However, being a spider crab, they have long limbs to compensate and make absolutely sure they look a bit gawky. The spider crab group also contains the decorator crabs, but I don't think the Orangutan Crab needs any more decoration. They are covered in a gloriously luscious coat of fine, red-brown hairs that sway luxuriantly in the current. Orangutan Crabs have no conception of the number of foxes we killed to get the same effect. For these crabs, such things come naturally. I'm sure they'd do one of those shampoo adverts if the money was good enough, but they'd probably be worried at first because they don't actually use the product. No doubt the company would reassure them; just read the script! It's not an eyewitness testimony! They probably wouldn't want to use shampoo anyway. Their fur is actually where a lot of their food comes from. 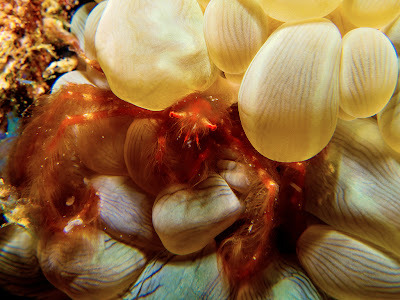 Orangutan Crabs feed on all manner of plankton, and all manner of plankton is just the kind of debris that gets caught up in their beautiful fur. 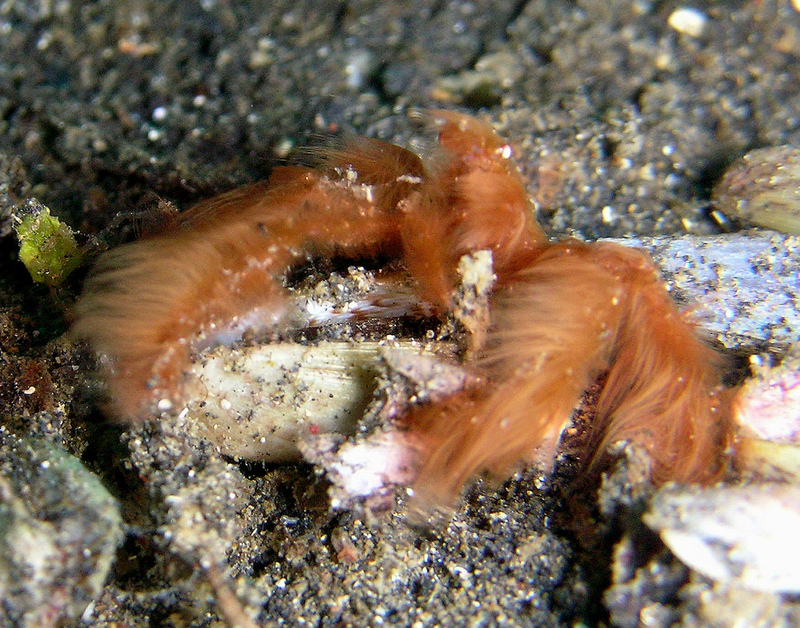 At the end of long chelipeds are tiny pincers the Orangutan Crab uses to groom itself for food. I bet real Orangutans do exactly the same thing in trees, picking out parasites and bits of leaves and stuff. It makes me wonder who the real Orangutan is. Isn't the ape Orangutan actually a nightmarish abomination of human spliced with Orangutan Crab after a terrible nuclear accident at an aquarium? Is it not... MANT!? underwater fur is just freaky! Now I'm imagining an ape with pinchers. @TexWisGirl: Yeh! We have all sorts of mammals underwater but it takes a crab to show them how to it. @Crunchy: Haha! Your sincerely welcome! Thanks for this info. I really needed this to finish a marine science project. Couldn't find anything about the orangutan crab anywhere!